Missy Lauer graduated from Triple Crown Academy for Dog Training in Hutto, Texas, as a Canine Training and Behavior Specialist. 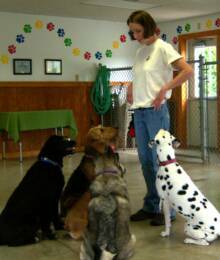 She is certified in Pet Saver training, pet first aid and CPR. Missy is a professional member of the International Association of Canine Professionals (IACP). Missy has personally trained over a thousand dogs of various breeds and temperaments in Texas, Virginia, and Pennsylvania. She has experience training basic and advanced obedience, agility, clicker, trick, Canine Good Citizen and therapy, conformation, rally, scent detection, and search and rescue. Missy believes that all dogs can have the best life possible through training and care. Dogs are terrific creatures and bring a lot of joy to her life. Her goal is to help her clients and their dogs experience this same kind of joy in their lives.